They say everyone has a book in them somewhere. The one that has been strolling around inside my head for forty years (okay, I am definitely dating myself…) is finally here — now — in all its digital download splendor, at SmashWords.com, an eBook web site designed to permit you to read books online as well as by way of every kind of down-loadable format you can think of. 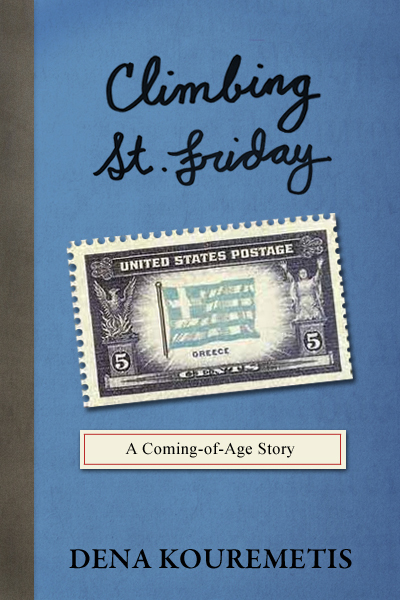 Climbing St. Friday is a coming-of-age story that chronicles a year in a young girl’s life that forever changed her. It is a poignant look at an age of innocence set against the backdrop of a foreign country controlled by its military forces. The eighteen year old girl that arrives on a huge ship in the Greek port of Piraeus the summer of 1970 does so with an excitement equaled only by her wander-lusting father, who completed his own odyssey to the ‘old country’ at precisely the same age in 1938. Deciding how to and when to present this tale was not easy for me. I knew that if I waited too long to tell it, my memories of that time some four decades ago might not be as complete. But just as you may have a strong memory of an event or time that serves to define a chunk of your life, I felt it was time to tell my own. I see this completed work as a work of nostalgia, humor, and history all at the same time, hearkening back to an era when ‘peace would guide the planets and love would steer the stars’ in a rapidly-changing world. The sweetness of growing up in a fun-loving but tightly-knit family served as the cliff-top from which I spread my wings and took flight. Once I took that first step, however, I knew I would never view life from the same perspective again. I hope you’ll take the time to peek inside this little eBook and sample it, download it, and/or review it. It will be available through most well-known booksellers soon and I encourage you to be among the first to preview it. Someday it may also be in print but I’m in no rush and have no plans to self-publish. My wish is that it evokes some feelings of watershed realizations you may have had in your own life, reminds you of a more innocent time and above all — makes you smile. Dena Kouremetis is the northern California area director for WhyMyKid.org, an organization that works with schools, businesses, colleges, associations and senior communities to spread the word on identity theft safety. Now the #1 crime in America, ID theft already affects 1 out of every 3.5 border state residents. These eye-opening educational workshops are FREE. Contact Dena at 916.984.1049 to find out more about setting up an ID theft safety training workshop at your child’s school, your place of business or your organization.